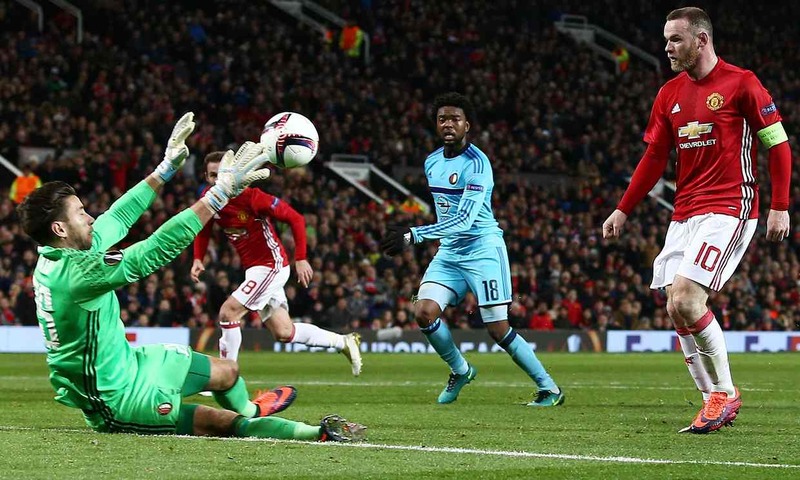 Manchester United hosted Feyenoord in the penultimate game of the Europa League group stage. The reverse fixture went the visitors' way in the first match with a scoreline of 1-0, but Manchester United and Jose Mourinho were looking to make amends. Given United's home advantage, Jose Mourinho decided to switch things up in the squad with Sergio Romero replacing David de Gea in goal and Luke Shaw coming in at LB after quite a bit of time out. We also saw Wayne Rooney on the wing along with Carrick in CDM being paired up with Paul Pogba. The highlight of the match however, was the inclusion of new signing Henrikh Mkhitaryan in the starting 11 after what seems like an eternity. The fan favourite got injured at the start of the season, and got very little time on the ball but knowing his caliber, the fans wanted him to be included in the squad for longer periods of time and for this match at least, Jose complied. The first half started in an explosive fashion for Manchester United, having the goal in mind, and working towards it. One could see the Jose affect taking place on the team in the best possible manner, keeping possession for the most part and retaining it for the rest, but attacking simultaneously and dominating Feyenoord, at least on paper. This form has been present at most home games that United has played so far in the season. Mkhitaryan's presence was also felt almost instantaneously, his tactical ability and footwork seemed to be the missing piece in the puzzle for Manchester United's impractical lack of shots on target and behind the net. I would seriously love to count the number of chances United players got and either didn't or weren't able to score, but given their sheer number, it would take a long time. For most of the half, the ball was in the visitors' half and got as close as just outside the box, and it took a swarm of Feyenoord players and a few lucky offside calls to keep the attacks at bay. However, between putting their heart and soul into their defence, Feyenoord got a chance on a wonderful counter, but a double save by Sergio Romero kept the score even and got him the respect and he deserves. It was fantastic to see him respond to a call of duty despite not playing for so long, and in such a wonderful fashion at that. It was perhaps that incident that stirred up the Manchester United players and it showed as 10 minutes later, the hosts got their first goal as Zlatan Ibrahimovic passed the ball to Wayne Rooney, who dinked the ball right above the charging goalie to give Manchester United the lead. Some might argue that Rooney was in an offside position, or that he pushed a player over to get into his position, but his "nudge" was extremely inferior to what the Feyenoord players were getting away with, so call it karma or whatever you will, but Wayne Rooney is just a couple of goals away from breaking Sir Bobby's record. The half ended at 1-0 with both teams searching for a goal for radically different reasons. The second half was all Manchester United. In the Premier League, for the past few matches, whenever United have had a one goal lead at home, most teams have equalised, including Arsenal last week so United fans were rightly afraid that the same could happen in this game as well. However, it did not. Feyenoord got the half started and got the ball to the United box but that was all. That was arguably, the only chance they had in the entire half, the rest was all Manchester United. Pogba and Carrick did a brilliant job of holding the midfield as Mata, Rooney, Zlatan and Mkhitaryan did their jobs in a fantastic fashion. They seemed like a firing squad constantly shooting at the goal and that bore fruit in the 69th minute as Wayne Rooney's no look pass found Juan Mata right in front of the goal to make it 2-0. Relief was all one could see on Jose Mourinho's face. Things seemed to be slipping out of Feyenoord's hands as Mkhitaryan got a couple of chances but wasn't able to finish and the goalie's foot compensated for a mistake as it stopped Zlatan's shot from heading into the goal, much to the Swede's frustration. He wasn't done though as he came to the edge of the box, assisted by Marcus Rashford, who came on as a fresh pair of legs right after Mata's goal, replacing the goalscorer. Zlatan shot right towards the goal from the "impossible angle", and the ball, hitting the goalie's inner thigh (ouch), headed right into the goal in the 75th minute. The game was done, or so we thought. Youngsters Memphis and Jesse Lingard came on for Wayne Rooney and Henrik Mkhitaryan to spice things up a bit and were explosive as soon as they stepped foot on the pitch. Lingard much more than Memphis though. 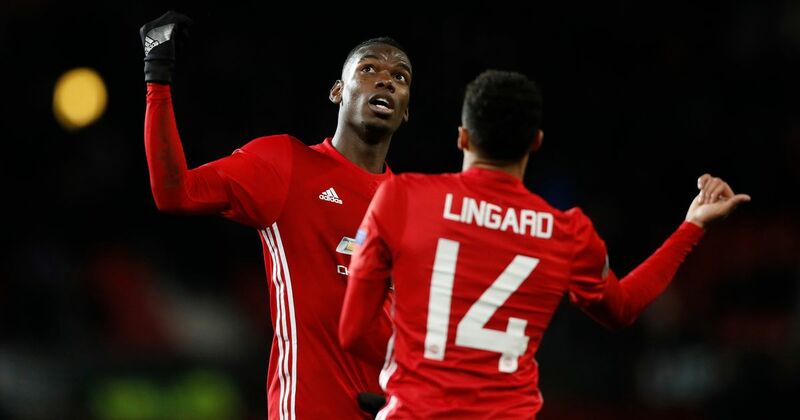 Jesse Lingard seems to have Paul Pogba as a friend, mentor and perhaps a role model and it seems to show as he looks like a miniature version of him while playing. Immediately after coming on, Lingard got a couple of shots on target, and it so had to be that he scored from right outside the box in the final minute, something that Pogba had been trying to do all game, but the latter was delighted as the two celebrated in a more interesting fashion. I'm still all for the dab though. Bottom line, it was a good confidence booster for Manchester United, who head into a busy week after this match. They are now second in the group, at 9 points and one behind Fenerbache. This should carry them to the round of 32 if they are able to draw the next game against Zorya at their home. The problem for them is that the match is an away game and Manchester United and away games haven't really been the best of friends in the Europa league. Feyenoord face Fenerbache in the final match of the group stages and at 7 points, the game is a must win for them. Luckily, they happen to be at home for that game, but Fenerbache are arguably the toughest side to face in the group so the match promises to be an interesting one. Even if Feyenoord win, they're counting on a Manchester United loss to advance to the round of 32. Things, therefore are looking questionable for the dutch side in the Europa league.